What’s a Trip to Jamaica Without Some Good Jerk Chicken? While nothing is more Canadian than having a cold beer and watching hockey, there are probably not many more things that are more Jamaican than drinking a Red Stripe and eating jerk chicken. As mentioned in my last blog, when it was time for lunch everybody that I was with wanted to go for good jerk chicken. Thankfully, when it came to finding a good restaurant, we knew we were in good hands. We were spending the day with Patrice Bailey, a well-known tour guide in the area and she highly recommended Scotchies Jamaican Restaurant. 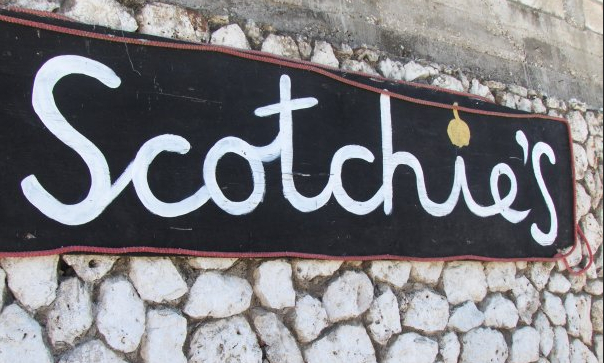 Scotchies is a small restaurant chain with three or four locations on the island. They specialize in making authentic jerk chicken by placing it on a wood fire, covered with bamboo. While the food is cooked low and slow, you really can’t beat it, whether you order chicken, ribs, or any of their side dishes. Everything comes out hot, fresh and right off the grill! The price is ridiculously reasonable. At Scotchies you pay for your food, find a table to dine at and pick up your meal when it is ready. While the service may have been a bit slow (hey…good food takes time! ), I was really impressed at how clean the employees kept the seating area. As soon as guests left, employees rushed to clean off the tables, so they would be available for other guests. One thing that I always look for in a restaurant is whether locals are also eating at the establishment. Since more than half of the people eating at Scotchies were locals, if the food keeps them coming back, it clearly has a good reputation. In fact, we didn’t arrive at the restaurant until after 2 pm and the place was still packed with a lunch time crowd! If you get down to the area, I suggest grabbing lunch or dinner at Scotchies. Sun… ✓, fun… ✓, and good food… ✓! Ja’ Makin me Happy…Patrice Bailey! Last year, I got to know Patrice Bailey when I began planning a day trip for my family to explore the area near the Port of Falmouth in Jamaica. Our cruise ship was docking there for the day and I wanted to plan an excursion to make the most out of our stay, since my research showed that the port was located in the middle of nowhere with nothing really around it. While I was surfing the web for ideas, a tour guide by the name of Patrice Bailey kept coming up…and with great reviews, I decided to send her a short email. Within a few hours, I was communicating with Patrice by phone and email, and we made an arrangement to hire one of her colleagues to drive us from Falmouth to a beach in Montego Bay, since she herself was fully booked. When we arrived at the port, Patrice introduced herself with hugs all around before sending us on our way, with our tour guide. We immediately felt like family. Our tour guide was really friendly and he even managed to give us a short tour of the area before taking us back to the ship. He also took us to a great local place for Jamaican patties, which was the icing on the cake! Flash forward to 2017 and I gave Patrice a call when we chose a cruise revisiting Falmouth. Since we had developed more of a personal friendship over the last year, during our numerous email exchanges, I invited Patrice to lunch as a thank you for planning a great trip the year before. Patrice accepted the invitation but when we arrived, she surprised us with an entire day of fun filled activities. Patrice took us on a tour of the area, which included the neighbourhood that Usain Bolt grew up in, as well as a couple of gorgeous lookout points. We then went to a secluded beach, where there were only a few other people nearby and you could see blue water and white sand for miles. When we were ready for lunch, we asked her about good, local jerk chicken. Patrice said, for really good jerk chicken, she would only take us to one place and that began our 45 minute drive to Scotchies… more about that in my next blog. After our great lunch, Patrice showed us a few beach clubs that we can visit on future trips and took us back to the port where we hugged and promised to keep in touch. Being in the hospitality industry, I typically make friends wherever I go, but I have met my match in Patrice. If you are looking for someone to make your experience in Falmouth amazing, Patrice Bailey is definitely the way to go. She is really easy to deal with, professional, reasonably priced and a barrel of fun! As mentioned in my last blog, Cozumel, Mexico is one of the ports that I have had the pleasure of visiting during several cruises. Aside from scuba diving, one of my favourite things to do in Cozumel is eat at Los Otates, a local restaurant. Los Otates is an authentic Mexican restaurant, just off the beaten path, in an area that tourists rarely visit. If you didn’t know it was there…you would never find it! I first learned about Los Otates five or six years ago while I was in Mexico with friends. Unfortunately, I was unable to visit the restaurant on that trip, but my wife was lucky enough to eat at this hidden gem. She raved about it and since that time, I too have eaten more than once. I always look forward to returning. If I was to take you to Los Otates, you would probably think I am crazy based on its curbside appeal… because it has none. The restaurant is a small hole in the wall that has a green tin roof and a chicken wire fence on the side to close shop. The sidewalk leading up to the restaurant is in disrepair but it is in a safe part of town and the food speaks for itself. Los Otates is the kind of place locals go to after spending a night on the town. All the taxi drivers know it and everyone ends up there, since they are open until four or five in the morning. Really – you want great food? Ask a taxi driver. These guys know their stuff. They serve some of the best Mexican food I have ever eaten. They make the guacamole right in front of you, and melt the cheese for their signature dip, Queso Fundido, as you watch. There food is always fresh, served hot, and delicious. Aside from the quality, you can’t beat the price! Whether it’s beers for a $1.40 US, or tacos for $2.50 US, you will leave extremely full without putting a big dent in your wallet. To put it in perspective, four of us stuffed ourselves silly, ordered beers and apple sodas and our bill only came out to $38.00 US. You just can’t beat that! If you really want to experience authentic Mexican cuisine while in Cozumel, I really recommend that you abandon the tourist joints and head to Los Otates. They put the fun in “Fundido”! 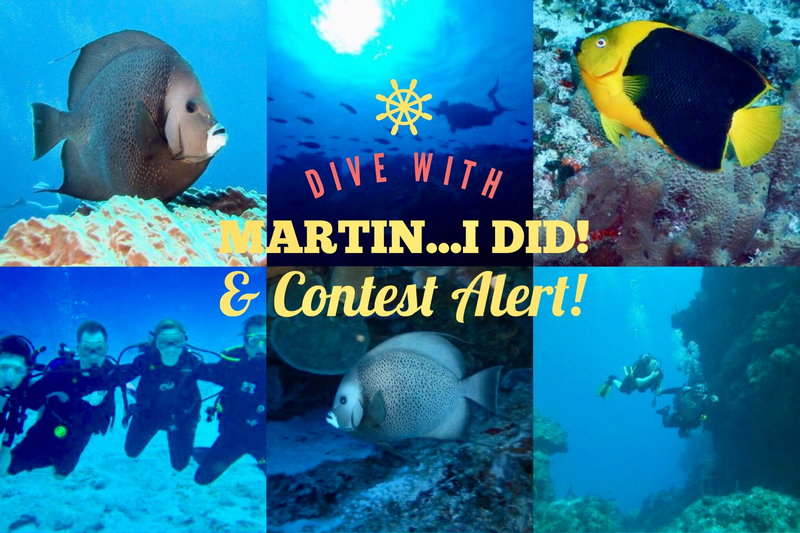 Dive with Martin… I Did! Many of the cruises I have taken over the past few years have docked at a port located in Cozumel, Mexico. When I visit the area, I normally go scuba diving. Cozumel is known for having beautiful diving conditions…so why wouldn’t I take advantage of it? When I was there last year with my wife and daughter, we decided to book a snorkeling excursion, since neither of them scuba dive. While there were dozens of local businesses to choose from, we chose to go on an excursion with Dive with Martin, since it was located right at the pier and they provide both scuba diving and snorkeling packages at a great price. This year when we were returning to Cozumel, I decided to call Dive with Martin to see what kind of deals they could offer us. Once again, they provided us with a better price than the other dive shops and even included the cost of the rental equipment in the low price. I have been very pleased with Dive with Martin as a company. They provide good quality equipment and fabulous customer service. All of their instructors are qualified, competent, friendly and professional and they always take us to great dive sites. As an added bonus, they let my wife and daughter come along on the boat for a nominal fee, so they could snorkel along the surface while my friend and I went drift diving. To make my wife and daughter feel more comfortable, the captain of the boat kept moving the boat closer to them as they drifted away from the boat. This was a nice touch and and truly went above and beyond to see to it that they felt comfortable and safe while snorkeling. If you decide to make a reservation at Dive with Martin, they have an associate working in the United States who can help you book your reservation. If you call… tell Paddie that David Lipton from Toronto says, “Hello”! Our friends at Mexico Xpertz are having a contest where they are giving away a trip to Mexico to one lucky follower. To enter the contest click here. Over the next couple of weeks I am going to begin a series of blogs about some great services and businesses I encountered during my recent vacation. As with all of my blogs, I will be highlighting both large companies and small businesses. For many years I have gone on a number of cruises. Most of the time when I go on a cruise, I sail out of Florida ports, such as Miami or Fort Lauderdale, however, recently my family and I decided to try something different when we found a well-priced cruise sailing out of Galveston, Texas. Unlike the Florida ports, where it only takes a short cab ride to get to the ship, the Port of Galveston is more challenging to get to since it is located about 45 minutes away from Houston Hobby Airport. After doing some research, it became clear, it was going to cost anywhere from $30.00 to $50.00 each way, per person, to get to and from the port. With this in mind, my wife and friend found a company that was on the lower side of the price scale – The Galveston Express. Not knowing what to expect, we booked our tickets and hoped for the best. We arrived at the airport pick-up location 30 minutes before our scheduled departure time and were delighted when our shuttle arrived 15 minutes early. The driver was very polite, professional, and organized. He helped load all of the passenger luggage into the vehicle and had a list of all the people who had a booking on this particular trip. The shuttle itself was a newer vehicle, very comfortable and well air conditioned. We had a great drive down to the port. After our trip, once again, the driver arrived at the port 15 minutes before the scheduled departure time. I really like this business practice. It puts customers minds at ease, knowing they did not miss their shuttle. The Galveston Express provides excellent customer service, current model vehicles, and the most reasonably priced transportation within the Houston area. While I’m not sure I would sail out of Galveston again, because of the added expense ($180.00 for a family of three) and unpredictable weather, I would not hesitate to use the Galveston Express if I was in need of a transportation provider.